From RichieBs collection via Flickr Blog This. In February 1971 £.s.d. was about to become £ & p. In order that the change over to decimal currency had as little an impact on the operations of Western National as humanly possible it was decided that a system of employee training was put into practice. To this end seven ECW bodied Bristol LS types were taken off the disposal list the previous November and converted to mobile classrooms. In order for conductors to familiarise themselves with the new currency, and to prevent the slowing of ticket issuing, these units travelled to WN's depots throughout their operating area and carried the legend "DECIMAL TRAINING UNIT" in the front destination aperture. The vehicle which we see here at Newton Rd., garage is TU6 (LTA981). This LS was new to Southern National in January 1953 as fleetnumber 1684. It was transferred to WN in 1969. 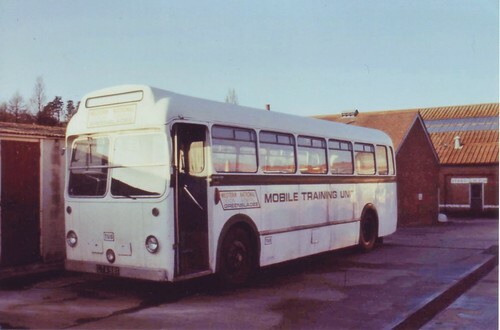 With its currency duties done it was converted to a driver trainer, as we see it here, in 1972 but spent little time in this role prior to disposal. As always I recommend a visit to Richies Flickr pages there are some great photos there from all over the place!